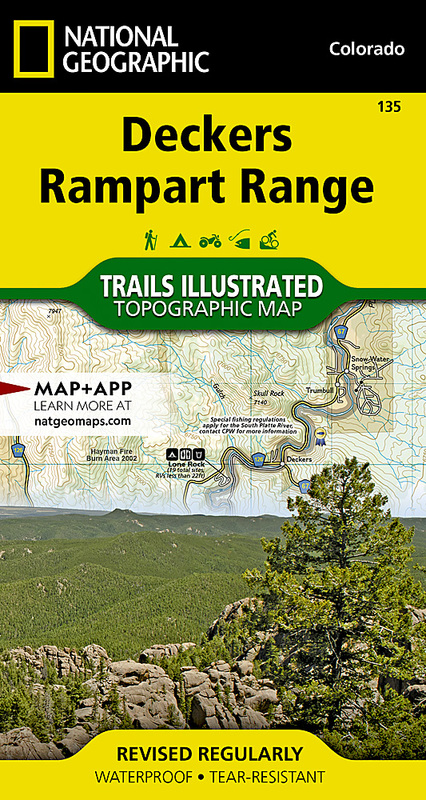 National Geographic's Trails Illustrated map of Deckers and Rampart Range combines unmatched detail with helpful information to offer an invaluable tool for making the most of your exploration of this area in central Colorado . Expertly researched and created in partnership with the U.S. Forest Service, Bureau of Land Management, Colorado State Parks and others, this map features key points of interest including Pike National Forest, Kenosha and Tarryall Mountains, Cheeseman Lake and Canyon, Lost Creek Wilderness and South Platte River. Also included are descriptions and inserts of Chatfield and Roxborough State Parks. Clearly marked trailheads will lead you to trails that are marked according to their designated usage. Many trails within Roxborough State Parks include mileage markers as well as their level of difficulty. The Colorado Trail that snakes through the area is highlighted. The map base includes contour lines and elevations for summits, peaks and passes. In addition to biking and hiking, many recreation features are noted including areas for climbing, water skiing, swimming, fishing, wildlife viewing. Other features found on this map include: Cheesman Lake, Devils Head, Lost Creek Wilderness, North Fork South Platte River, Pike National Forest, Rampart Range, Thunder Butte.